Halogen, Xenon, Fluorescent, or LED: What is the best type of under cabinet lighting? If you've ever asked yourself that question, you were asking the wrong question. There is no "good, better, best" with under cabinet lights. Choosing the right light is a matter of personal preference, and it depends on how much you value dimming, heat reduction, color accuracy, and energy savings. Xenon under cabinet lights are an update of older Halogen lights. Halogen under cabinet lights, especially the light "pucks" you see in hardware stores, are cheap and provide perfect color accuracy (color rendering index), but they use tons of energy and waste most of it as heat. Xenon keeps the benefits of Halogen, but burns brighter and cooler. Their color rendering makes granite countertops or trinkets in display cabinets look their absolute best, and because they are brighter than Halogens, Xenon bulbs save energy by using fewer watts than a Halogen bulb. Fluorescent under cabinet lights are a great choice for bright, energy-efficient lighting that burns cool. They're a popular choice in kitchen cabinets and pantries because they don't add extra heat to their surroundings, which can increase the likelihood of food spoilage. Unfortunately, there are a number of trade-offs. Fluorescent lights have relatively poor color rendering — 80 CRI to Xenon's 100 CRI — so they distort colors and make granite and marble countertops and backsplashes appear washed out. Furthermore, while they use much less energy than Halogen or even Xenon, they are not dimmable and some models are slow to reach full brightness. LED is the newest, most energy saving option for under cabinet lighting. To many, LED under cabinet lights are the perfect option. Unlike fluorescent, they are instant on and many models are dimmable. Unlike Halogen and Xenon, they also create very little heat. However, they do have two drawbacks: Color rendering and cost. Like fluorescent lights, their CRI is in the 80-90 range, so they aren't the best choice when color accuracy is highly valued. They also have the highest up-front cost of any under cabinet choice. On the other hand, they will save the most in the long-term. LEDs use only a fraction of the energy consumed by other types of under cabinet lights. 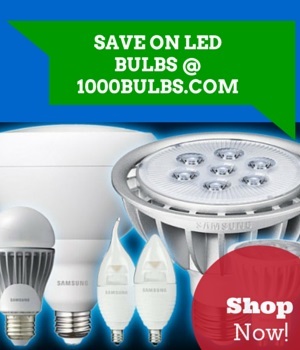 Even better, they last 20,000 to 60,000 hours, so you'll never have to replace them and will save on bulb replacement costs. Again, your choice of under cabinet lights will depend on your specific needs. In general, however, if you prize color accuracy and don't mind the heat, choose Xenon, but if you prefer energy savings and cool operation, go with fluorescent or LED. Of course, that's only what we think. Let us know which under cabinet lighting option you prefer in the comments, or drop us a line on Facebook, Twitter, or Google Plus.